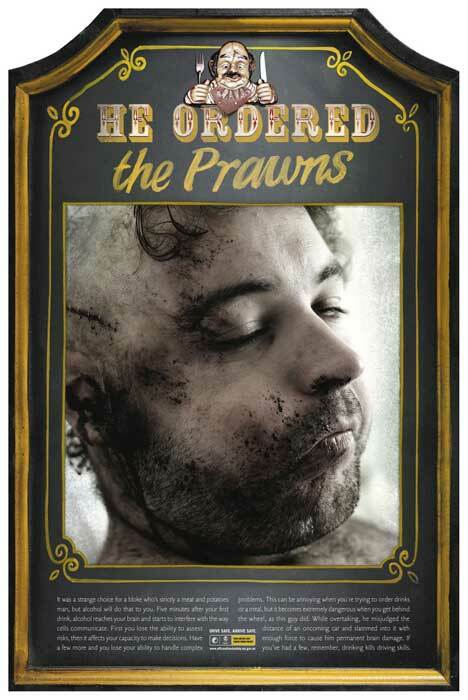 The Office of Road Safety, Western Australia, has launched a set of print advertisements making the connection between alcohol-induced errors of judgment and vehicle accidents. We’re introduced to the guy whose face is puffed up due to ordering prawns under the influence of alcohol. The guy who tripped on the dance floor, too drunk to manage. And the guy who had an embarrassing encounter with a pool table. As we read on through the small print (if we get that far) we discover that the pictured injuries come from alcohol-related car crashes later in the evening. He ordered the Prawns. It was a strange choice for a bloke who’s strictly a meat and potatoes man, but alcohol will do that to you. Five minutes after your first drink, alcohol reaches your brain and starts to interfere with the way cells communicate. First you lose the ability to assess risks, then it affects, then it affects your capacity to make decisions. Have a few more and you lose your ability to handle complex problems. This can be annoying when you’re trying to order drinks or a meal, but it becomes extremely dangerous when you get behind the wheel, as this guy did. While overtaking, he misjudged the distance of an oncoming car and slammed into it with enough force to cause him permanent brain damage. 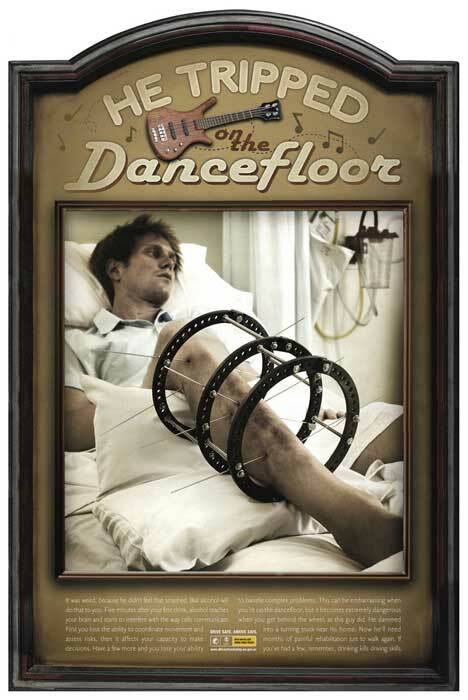 If you’ve had a few, remember, drinking kills driving skills. He tripped on the dance floor. It was weird, because he didn’t feel smashed. But alcohol will do that to you. Five minutes after your first drink, alcohol reaches your brain and starts to interfere with the way cells communicate. First you lose the ability to assess risks, then it affects, then it affects your capacity to make decisions. Have a few more and you lose your ability to handle complex problems. This can be embarrassing when you’re on the dance floor, but it becomes extremely dangerous when you get behind the wheel, as this guy did. He slammed into a turning truck near his home. Now he’ll need months of painful rehabilitation just to walk again. If you’ve had a few, remember, drinking kills driving skills. 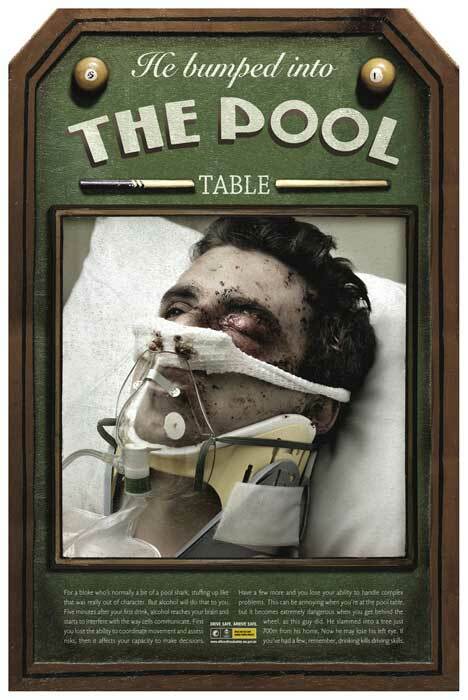 He bumped into the pool table. For a bloke who’s normally a bit of a pool shark, stuffing up like that was really out of character. But alcohol will do that to you. Five minutes after your first drink, alcohol reaches your brain and starts to interfere with the way cells communicate. First you lose the ability to assess risks, then it affects, then it affects your capacity to make decisions. Have a few more and you lose your ability to handle complex problems. This can be annoying when you’re at the pool table, but it becomes extremely dangerous when you get behind the wheel, as this guy did. He slammed into a tree just 700m from his home. Now he may lose his left eye. If you’ve had a few, remember, driving kills driving skills. Drink driving contributes to about one in every five fatal crashes in Western Australia. Most people do not drink and drive on a regular basis. However research shows that around 43 per cent of Western Australian drivers aged 17 to 59 years admit to consuming alcohol prior to driving in varying degrees. Of these, 26 per cent consume one standard drink, 45 per cent consume two standard drinks, while the remaining 29 per cent consume three or more standard drinks prior to driving. The main objective of this road safety campaign is to increase the awareness of the mental and physical effects of alcohol consumption on a person’s ability to drive. The primary target audience is 17 to 39 year-old male drivers in metropolitan and regional Western Australia. The target audience is likely to drink and drive through lack of commitment to planning, drive if they do not have far to travel, believe they are capable of drinking just to the legal limit and still driving; and believe there is little chance of any negative consequences if they did drive. This road safety campaign was developed at Marketforce, Perth, Australia, by executive creative director Andrew Tinning, art directors Julia Elton-Bott and Murray Laird, copywriters Andrew Tinning and Tom Wilson, with photographer Allan Myles and retoucher Madeline DePierres.